Jakarta Deputy Governor, Sandiaga Uno, inaugurates the Family Entrepreneurial Movement of One District One Center (GWKH OK OCE).
" we will see more successful entrepreneurs and their families happy"
On the same occasion, it was also launched the 2018 Betawi Cultural Religion OK OCE Setu Babakan. Sandi expressed this program is to improve the welfare of society in a sustainable way through entrepreneurial movement. 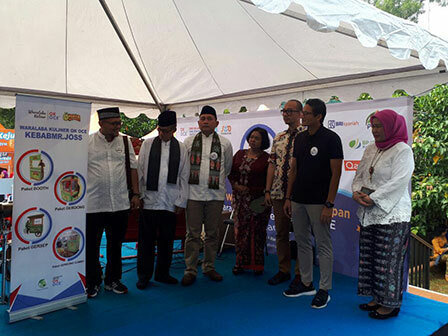 "By so, we will see more successful entrepreneurs and their families happy," he stated, in Betawi cultural area of Setu Babakan (PBB), Jagakarsa, South Jakarta, Saturday (3/3). He explained, Setu Babakan has the potential to become a magnet of people's business and micro-economic development. Even, this area will become a special culinary center of Betawi and tourism in South Jakarta. "We hope that people can develop their business via mentoring prepared by OK OCE program," he stated. In the meantime, OK OCE Movement Association Chairman, Faransyah Jaya added, this program is as a form of collaboration between the people, community movers, government, and private sector. "This movement can have a wider impact for Jakartans who want to become entrepreneurs. OK OCE can synergize with Family Hope Program," he stated. As for the information, the launch event is enlivened with Betawi cultural art titles, franchise exhibitions, edufair, craft and culinary bazaars, fundraising, and entrepreneurship clinics.